Disney’s stewardship of Star Wars is running at a heck of a pace. And that’s no bad thing. 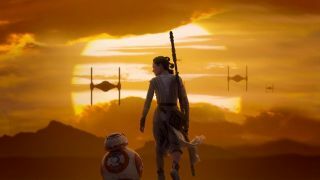 After 15 years of bad – or non-existent – Star Wars between The Phantom Menace and The Force Awakens, the world has a lot of Force-powered goodness to catch up on. So now, before the sequel trilogy is anywhere near finished, we already have an officially announced fourth trilogy, to be headed up by Last Jedi director Rian Johnson. But what’s it going to be about? All we know so far is that it’s set in “a corner of the galaxy that Star Wars lore has never before explored”, and is being treated by Lucasfilm as a blank canvas. That means that all options are very much open. In fact more than that, it means that every option we’ve never even thought of is open. So, time for a bit of rampant speculation, then? Of course it is. To get the ball rolling though, let’s think about the phrasing in that Lucasfilm statement. “A corner of the galaxy that Star Wars lore has never before explored” presents a tricky conundrum. If we’re going to take the statement literally, then that surely means that the films will take place in an area we haven’t even yet heard of, because if any sort of lore exists there, then that’s technically a degree of exploration. Though at the same time, there’s room for some shades of grey here. Plenty of places have been referenced across the multiple Star Wars movies, TV shows, comics and novels, without their biggest stories being told in detail. And then, of course, there are the many places that have been discussed in the Star Wars Expanded Universe / Legends spin-off material, but which are now non-canon. Do they now count as unexplored? And how many are simply waiting in the wings to become official canon once more, perhaps via an appearance in Johnson’s new movies? All of this in mind, I don’t think we need to be too hard-and-fast with our definition of “unexplored”. There’s some justifiable wiggle-room here. Prime contenders? Combining the phrase “corner of the galaxy” with notions of untold stories immediately puts me in mind of the Outer Rim, the lawless, untamed, Wild West of Star Wars, free and distant from the central Republic’s (or Empire’s) control. Now, the Outer Rim has been explored a fair old bit during a multitude of canon Star Wars stories - it’s home to Tatooine, for instance, the planet where the Original Trilogy starts – but it does contain some important places that the movies have never yet touched, and which might (just might) become more relevant as the current sequel trilogy continues over the next couple of years. Chiefly, I’m thinking right now of the ancient Sith base-world of Moraband, aka Korriban. So far, only really (canonically) featured in the final episode of the Clone Wars animated series, Yoda visited the location in order to undergo trials through which to earn the right to manifest as a Force spirit after his death. What we haven’t seen though, is the part this now deserted tomb-world played in the story when active, during the formation and consolidation of the Sith, millennia previous. The Lucasarts statement doesn’t make any mention of the time period to be featured in the new trilogy, so an extreme prequel regarding the splintering of the Jedi and the start of the Light/Dark war is still wide open as an option. And heck, after the bad job the prequel trilogy did of exploring the relationship between the two sides, a more thoughtful, nuanced version of the real start of the story might be very welcome indeed. There’s some really rich material to draw from if we go back that far. A Jedi Order confident – perhaps complacent – in its position on the Force, and the power and authority it wields through it. The discovery of the Dark Side, via the experiments of a lone, currently unidentified Jedi (convenient for building a new story around, no strings attached). The original schism between Light and Dark, and the Hundred-Year Darkness, during which the Sith solidified into a tangible order, and set up formal opposition to the Jedi. There’s potentially a century or so of story to tell here, giving scope for a truly epic trilogy that might break with tradition by jumping forward decades between each film. And perhaps even more excitingly, after 40 years of Star Wars films dominated by the dichotomy of Light and Dark, we’d finally get to see the Star Wars galaxy before any such defining conflict existed, and perhaps even speculate on the role of unquestioned, Light-led Jedi dominance. There is meat to chew on there, and potential for some serious, heady, philosophical themes and emotive character drama of exactly the type the prequel trilogy had gifted to it, but entirely squandered. And entirely the type, in fact, that Johnson’s The Last Jedi is built out of. And let’s face it, having dealt with Luke, the Jedi Temple, and the kind personal journey the self-exiled Skywalker was on, Johnson is now no stranger to the heavy fundamentals of Light vs Dark (and what lies in between). Going back to that point in Star Wars history – long the sole preserve of the now decanonised Legends material – would also make for a much-needed break from familiar characters and situations. One of the biggest problems with the prequel trilogy was the way that it over-connected characters and storylines, making the galaxy feel smaller, not bigger. And as brilliant as it is, The Force Awakens’ reliance on echoes of A New Hope’s structure lent it a noticeable, albeit less problematic, familiarity. Go back to the very start of the central conflict though – before it, in fact – and you do indeed have the clearest, blankest canvas imaginable. You’d have the first Star Wars movies ever made that were entirely free of influence from earlier established historical lore. Clean, easy, and wide open to explore in any way Johnson might wish. Having a look through the responses our Entertainment Editor, Lauren, got when she asked Twitter what it wants from the new trilogy, it seems that I’m not the only one thinking along these lines. Requests for the early days of the Jedi/Sith dichotomy are by far the most frequent responses. Darth Bane is a very notable character in ancient Star Wars canon – and he does remain canon, thanks to an illusory appearance in, again, The Clone Wars. A Sith who lived a thousand years before the Clone Wars, he was the one who instigated ‘The Rule of Two’, the Sith doctrine that demands only two Sith ever exist at a time, a master and an apprentice. The reason for this was the eventual fall of the larger Sith Order, as a result of in-fighting – as detailed in the also mentioned Tales of the Jedi comics – which led to their being weakened enough to be near-eradicated by the Jedi. There’s actually a heck of a story to be told in this alone. If we’re talking about a trilogy that breaks with tradition and tells serious Star Wars lore in a different way, how about Johnson’s story only starts with the Sith break-away from the Jedi, and then primarily follows the rise and fall of the Sith Order itself? We could come to understand the fall-out with the Jedi, and the embracing of the Dark Side, from an entirely more sympathetic, human perspective. We could see the rise and fracture of the Sith Order – perhaps an order with some worthy potential at first – before its inexorable slide into evil and self-destruction. We could witness the great Sith / Jedi War, and see the Jedi really go through the wringer, being forced to hunt and destroy their former brothers and sisters through the hardest test in their history. And we could see it all end with Bane instigating The Rule of Two, and the Sith’s resolve to hide itself away in the shadows. Which would lead us, give or take a millennium, straight into Star Wars: Episode One. After nine Star Wars films telling the story from the Light Side perspective by default, with the rise and fall of the later Jedi Order one of the key events, doing the same for the Sith (thousands of years earlier) would make for a powerful, parallel-yet-contrasting cyclical harmony. And if there are two things Star Wars likes, it’s parallels and cyclical storytelling. And also, balance. Of course, there are other ideas to explore. We could, as others on Twitter have suggested, explore smaller, more personal stories in far-flung parts of the galaxy largely untouched by Republic and Empire, Jedi and Sith. We could follow an X-Wing squadron, and see the conflict from an entirely different perspective, or follow a war movie trilogy about a platoon of Stormtroopers (which is touched on in the game Star Wars: Battlefront 2). But for me, if Johnson’s trilogy is going to be a truly big deal – and with Disney and Lucasfilm announcing it before even the release of The Last Jedi, that implies serious confidence in both the director’s current film, and his future Star Wars importance – then there’s one obvious place to be. One clear period to visit, and a huge swathe of open, unspoilt storytelling to explore, rich in weighty potential the like of which Star Wars has rarely seen. Time, I think, for a long, long, long, long, long time ago, in a galaxy far, far away.